The author of the Australian-based Hazard River Series is an old friend of mine. In our younger years as girls-about-town, we shared many a fab evening and a few mad holidays together. She now lives back in her native Australia with her family and has just published the books which will hopefully soon be available on Amazon and are already available in Australian bookshops. See below for more details! 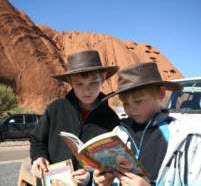 Hazard River is a new adventure series from Ford Street Publishing for readers aged eight to ten. The emphasis in the series is on fun and action, but each story has an environmental theme. It offers young readers a message without lecturing. 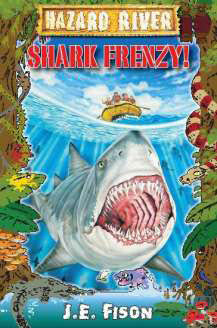 The first two stories in the series, Shark Frenzy! 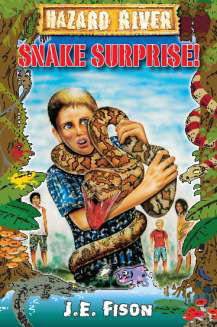 and Snake Surprise! will be out in October. They will be followed in March by Bat Attack! and Tiger Terror! Shark Frenzy! : Jack Wilde and his friends are on holidays at Hazard River when they discover a dead shark washed up on the sand. It has no fins. Is it the work of a monster shark… a giant squid … or pirates? The gang decides to investigate. But finding out what killed the shark lands the kids in a whole lot more trouble than they ever imagined. Snake Surprise! : It’s a boring wet day on Hazard River until Jack Wilde and his friends find a note on an abandoned boat. The message is damaged but they can all read the words HELP ME. The gang must find out who needs help and why. But as they get closer to the answer, will they be the ones who need help? The Hazard River series is adventure, fun and unputdownable action – a page turner from start to finish. J.E. Fison is a television reporter turned children’s author. Her work has been short-listed for the Raspberry and Vine Short Story Competition and was long-listed for The Times (London) Children’s Fiction Competition 2009. 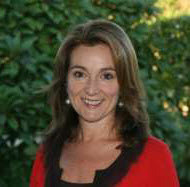 Prior to writing the Hazard River series, she spent 20 years in news and features in Australia, Asia and the UK. Julie was a television news reporter and anchor for Asia Television in Hong Kong and a producer in London for Worldwide Television News. More recently she has written travel stories for The Australian and Australian Traveller and businesses pieces for The Australian Financial Review. She lives in Brisbane with her husband and two sons and spends as much time as possible on the Noosa River, the inspiration for the Hazard River series.